1st (Bilingual) & 3rd (Spanish) Wednesday of the month, 6-8PM, Sierra Linda Elementary- 2201 Jasmine Ave., Oxnard 93036. Are you a grandparent, aunt, uncle or older sibling raising a related child with full responsibility? 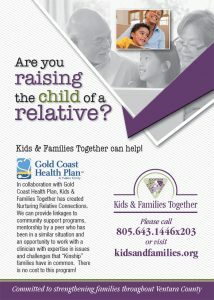 Kids & Families Together is offering Kinship Support and Resource Groups in a number of Ventura cities to help you and your family thrive! In partnership with Ventura Foster & Kinship Care Education Program of Ventura County Community College District. Please contact us for more information- (805) 643-1446.